Conor, Bronze Ed. of 6 H38 x L66 x W34 cm. Riastrad, Bronze Ed. of 6 h84 x 69 x 36 cm. Study for Etain VI, Bronze Ed. of 9 50 x 50 x 10 cm. 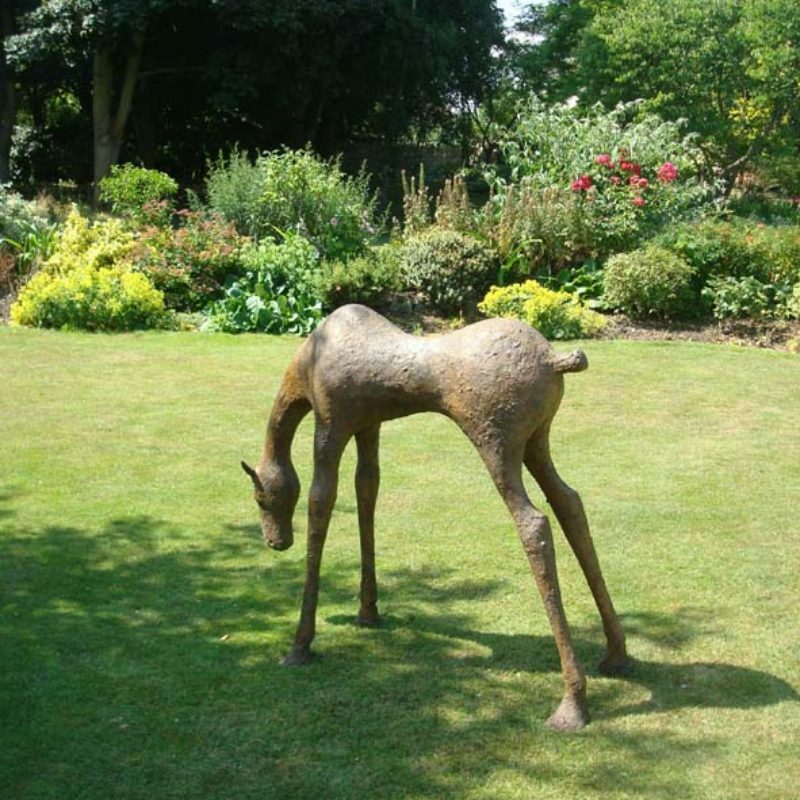 Study for Grazing Foal, Bronze Ed. of 9 h10 x 28 x 30 cm. Cian, Bronze Ed. of 6 h75 x 112 x 45 cm. 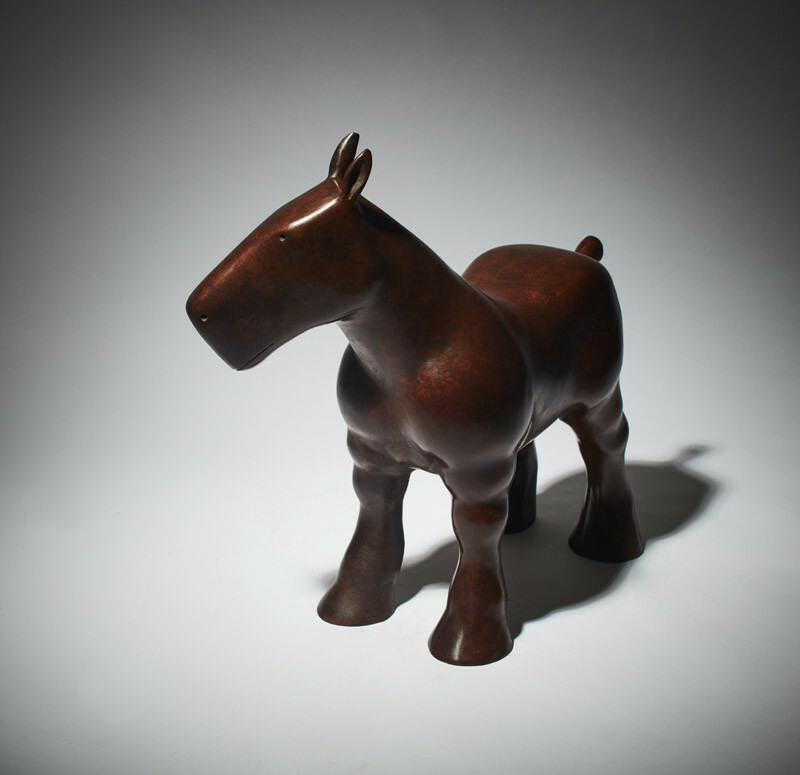 Draft Horse, Bronze Ed. of 9 H35 x L40 x W16 cm. Hunter Red Mask, Bronze Ed. of 9 h63 x 30 cm. Tuireann, Bronze Ed. of 9 h42 x 42 x 12 cm. Tadhg, Bronze Ed. of 6 58 x 35 x 38 cm. Study for Standing Ailbhe, Bronze Ed. of 9 h21 x 35 x 17 cm. 1991 – 1993 M.A. Ceramics, Cardiff, C.I.H.E. In one of the Táin tales that the artist was reading, in a description of a hog, a line jumped out: ‘Blacker than a smith’s coal; and the bristles on its head were like a thicket of thorn trees’. It was at this point that Anthony Scott decided to use nails for the bristles, albeit transferring them from the head of the animal to the spine. 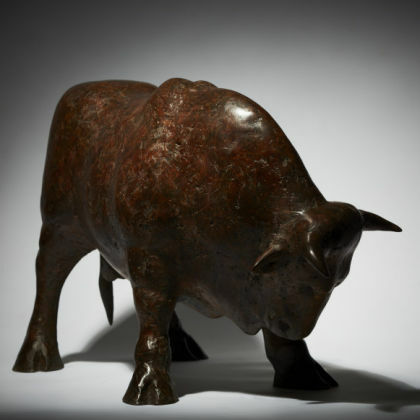 For the artist, amazed to find out, when a group of children visited his studio, that none of them knew the story of The Minotaur, ‘we’re losing something by not dipping into these stories. I was brought up on Aesop’s Fables! I don’t just read the mythology. I read books on anthropology, on the Neolithic mind and how it began to utilise symbols and create religion and a civilisation. I’ve been in the South of Spain, seen Cave Art – a truly remarkable experience when you go deep into a cave by torchlight and realise that someone with a hard lump of charcoal has crawled deep into this cave with a need to express himself, on a wall. It’s like the physical need to go into a studio’. Prompted by the reality of the Táin tale, the artist started off by sketching. He then alternated between working in wax and sketching, a dialogue between two and three dimensions in which, drawing by drawing, wax by wax, the basic lineaments of the composition were articulated. ‘The first thing I saw was the pointy eyes: light shining out of the darkness’, but interestingly, striking though this metaphor is, in the final work the eyes are implied rather than created, perhaps unconsciously because the ‘light out of dark’ metaphor has such strongly religious overtones, overtones which would be strongly in contradistinction to the pagan, mythic world of the hog. As the drawings progressed the ‘curling around’ stance of the pig, frozen in mid movement as it is alerted by some foreign sound, was established; so also the idea of the spine as a ridge of nails. Early drawings with diagonal line-shading prefigure this but it is the point at which the artist established that the diagonal hatchings could be converted into the armorial vertical strokes of the nails that constitutes the fulcrum of the design process. The whole notion of the sculpture being not only arrested movement but contained energy, of it being a work in which everything is directed, (like a frozen slingshot), towards the viewer, now emerges. Some of these preliminary drawings will have been generated by items from his archive boxes such as his own photographs, earlier sketches and clippings from magazines. It’s a process of addition and subtraction, of working quickly to establish a spontaneity of outlook in terms of the form. 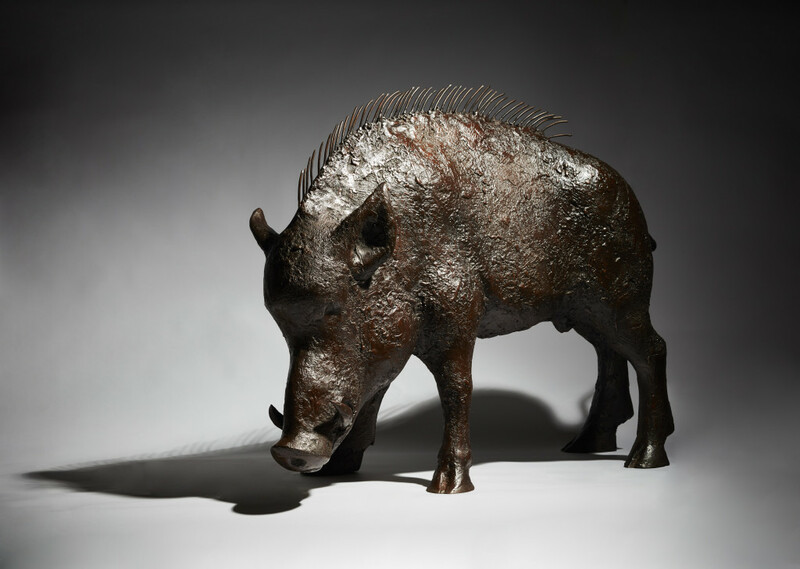 Once that is done, once he has established ‘the line’ (that sinuous, overarching outline which generates the contained force of the hog’s potential lurch in the direction of the viewer), then various details are required to be worked out: getting the angle of the head (‘the hardest part’); working out the bulk and volume of the animal – originally it was much fatter but in successive drawings it was streamlined, reduced substantially in volume, with an attendant emphasis on the controlled energy of the head and spine. As the dialogue between wax and paper continued, the wax was continually reworked, being cut into aggressively, added to, subtracted from, all the time being turned to ensure that it worked from every conceivable angle. As wax is soft, a support was necessary so steel frames were used for larger versions as by that point all of the formal problems had been resolved: ‘you’re looking for the magic. All of a sudden you can see the one line. Once you get that the whole thing begins to magically resolve. That’s when the process becomes enjoyable, rather than infuriating! Getting the size of the ears in relation to the head, for example. All of that is intuitive. The texturing is in the wax. You want it tactile but not so heavily textured that it distracts. I am going to make the nails bigger though!’ One can even see, in two of the preparatory drawings, ideas forming as to the patination of the bronze: russet-red scrakes of crayon suggesting both the autumnal patination of several of the bronzes as well as the life-force of the animal itself. Today, anything can be labelled as sculpture. You can go into a museum and find a video or digital film labelled as a ‘sculptural installation’. If you have walked through any of the recent Venice Biennales, you will have found floors and walls covered with found objects, ranging from coloured skeins of wool to children’s toys, the whole optimistically referred to as ‘sculpture’. Nowadays you don’t even need craft skills, even rudimentary ones. One well-known sculptor hands into his foundry a simple drawing, another a computer-designed image, and both leave it to the foundrymen to solve the technical problems and create the actual sculpture. ‘The sculptor’s hand’ in these cases, never even touched their sculpture until they were finished. Thankfully, Anthony Scott is not of this constituency. That said, his route to the sculptural path was not a normal one. There was no ‘artistic heritage’ in his background. At grammar school he was encouraged to do graphics and architecture. In Foundation Year at art college he studied jewellery for six months but found that ‘the welder and the bandsaw didn’t give me the immediacy that I wanted’, so he transferred into ceramics, never so much as considering a sculptural course. In hindsight this was fortuitous: ‘I was reborn. I was released’. Two and a half years were spent in this discipline, going into the Ulster Museum which had a remarkable ceramics collection, looking at work by Hans Coper (‘truly magnificent’), the whole clan of the Leaches, and Angus Suttie (‘a wonderful ceramicist’). He continued to study ceramics when he did his Masters at Cardiff, meeting Sue Hall, who came to lecture, Pete Castle and ‘the very spiritual Takeshi Yasuda’. What he liked about ceramics was the element of chance: ‘the whole firing and making was in the lap of the Gods’. 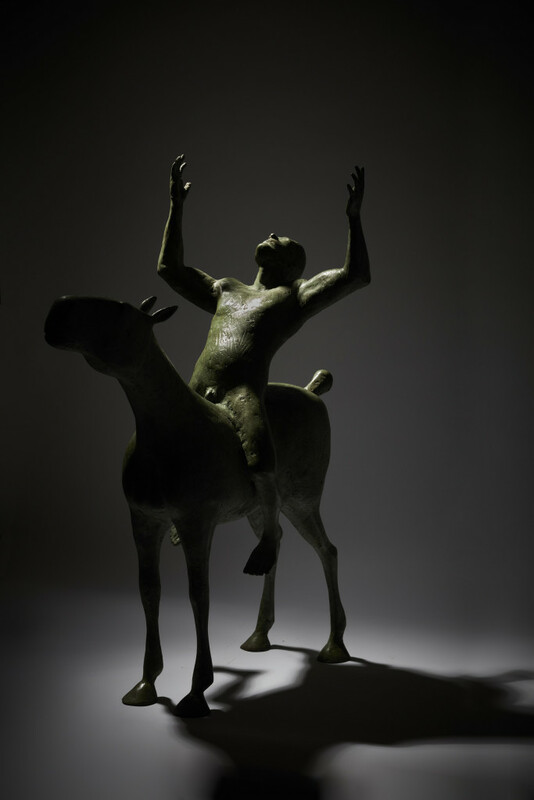 This was the period when he was encouraged to make figurative work, producing both human figures and anthropomorphic animals such as The Minotaur and The Stag. Some of these early forms with their connotations of shape-changing, still play an important role for him today as with the figure of The Horse which evolved from his earlier work. 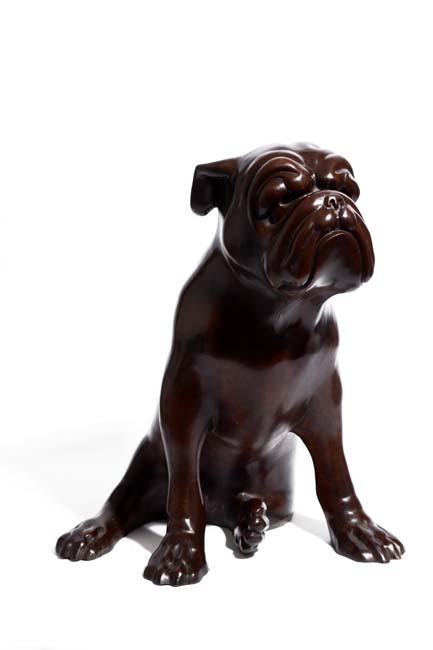 From roughly the eighties onwards there were continuing exhibitions of ceramics where the ambition was to be sculptural. Few of these ceramicists achieved a reputation outside of the ceramics world. 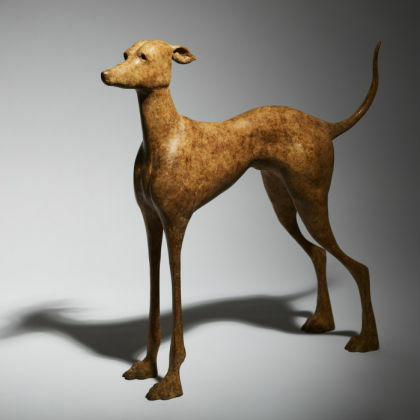 Scott himself, when he came back to Ireland after the Cardiff experience, initially worked in ceramics and initially had a kiln but when his first consignment of work was sent abroad, it arrived in fragments so the artist decided to work in a more robust medium, prompted by a client who suggested that he cast in bronze. 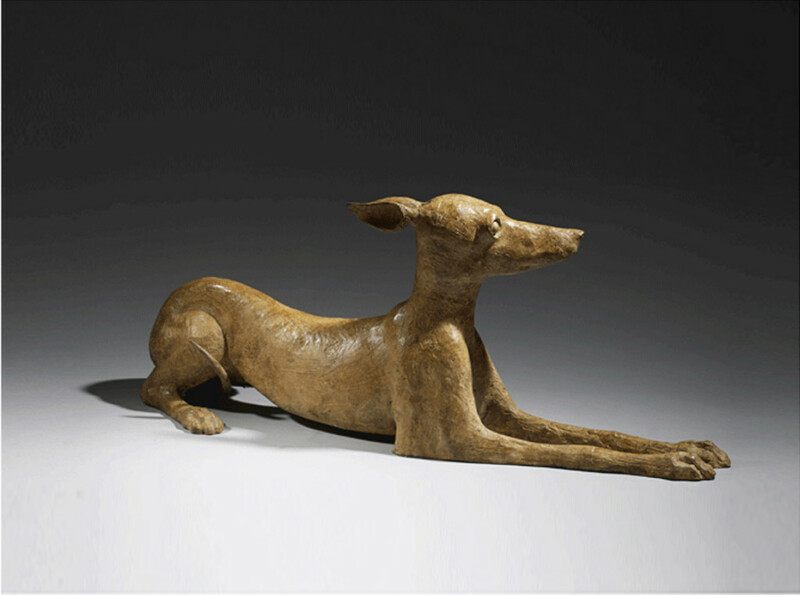 At this stage in his career Scott was already accustomed to the malleability of modelling in clay or wax, to using armatures, and to creating colour or patina in terms of different glazes. All of these were cross-transferable skills, ready to be used when upscaling to bronze casting. 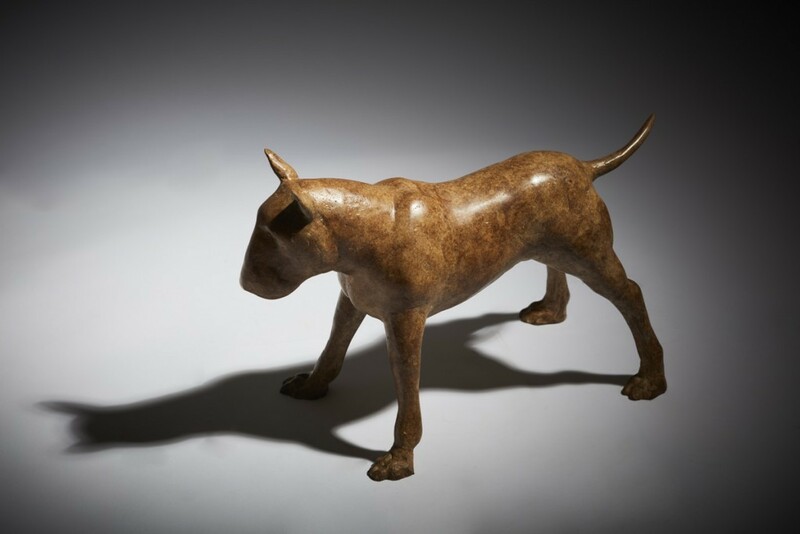 In effect he was escaping from what could be seen as a limited, craft-dominated world of ceramics, into the potentially more challenging world of freestanding, largescale bronze sculpture. Before looking at the kind of work that he produced then as well as the real and probable influences upon it, Wordsworth’s dictum of ‘the child is father of the man’ is worth bringing into play. Artists, whatever their medium or genre, are imprinted by their childhood, whether negatively or positively. 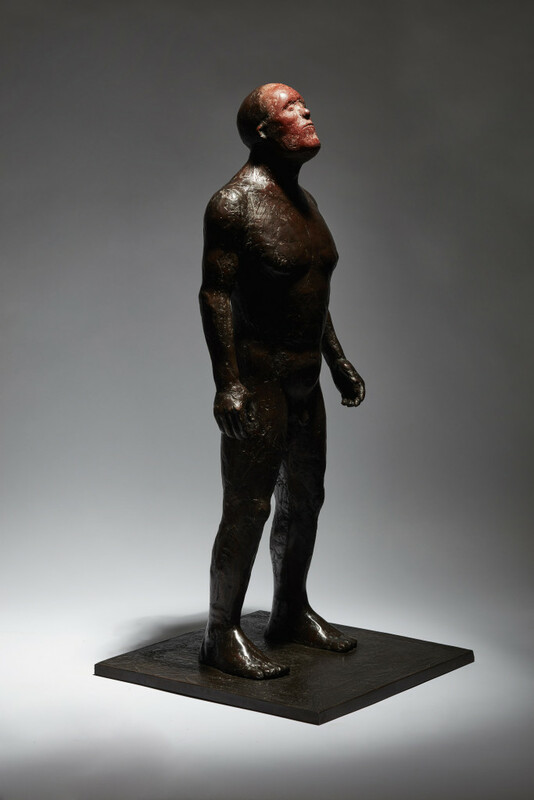 All of the major elements that surface in Scott’s sculpture have their sedimentary layers in his childhood: landscape as a sense of place conditioned by history; Irish mythology and the fabular world of tradition and fable; the archaeology and sculptural art of pre-history; the impulse to use one’s hands to make objects. Scott’s father was a farmer. The family had four farms then (five now), the biggest being eighty acres, with another of seventy-five and another of forty. On the main farm which he grew up on, there were twelve acres of ancient woodland, where sheep were forever being trapped and where, for the artist, there were atavistic elements reminiscent of the Irish director John Boorman’s film Excalibur. In terms of patinas, he was imprinted with the rich moss greens of the farm, the autumnal colours of rich reds, browns and the gold of gorse, all of which can be seen in the patinas on the horse, Etain, and the hog Cian. If you work on farms you need to be handy with your hands. Our language embodies this idea: a wheelwright is a maker (wright) of wheels, for example. Scott remembers his father using a scythe, an image which carries one back to Bruegel. It was a labour-intensive world in which there were ‘gifted guys who could do two acres scything in a day; a world of sandwiches in foil, glass bottles of tea stoppered with newspaper, sitting in the hollow of a rock to take your tea, and doorstopper sandwiches the size of bricks’. His father, he says, never tired of walking the land just for the pleasure of it, viewing the spectacular landscape where the glaciated ice had ripped through the countryside. This was a landscape populated by draught horses, sheep, pigs, dogs, by the blunt realities of birth and death, by physicality and the incipient threat of animal violence, such as that of a bull or a cow in calf. It was also a world, for the child, which was populated with fairy rings and standing stones when the child, on a good day, would walk through the fields on his way to school. Scott was born in Enniskillen but grew up in Belcoo (literally ‘the mouth of the hound’) with Black Pig’s Dyke close by as the boundary between Ulster and Connaught. The aforementioned ancient woodlands soon became the repository for the ancient mythology of The Táin as discovered in Thomas Kinsella’s poetic translations, and Lady Gregory’s Gods and Fighting Men. On the shores of Lough Erne itself, which was populated by ancient stone sculpture (admirably recorded in Helen Hickey’s book Images of Stone) a mere ten minutes journey by boat ‘brought you back five thousand years’. Later, when he was doing his Masters, the artist would make a trip which would take him from Tara and Newgrange, through Connemara and into Galway to visit the ancient sites of history. Where his studio is now, he is within sight of the location of those mythic tales of The Táin. 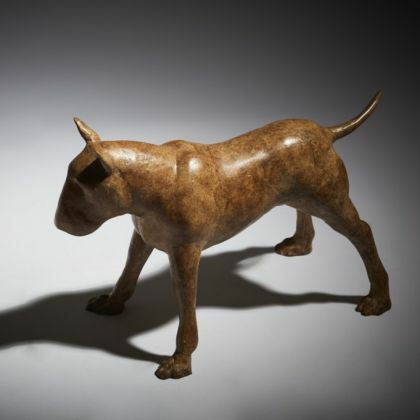 To return to the crossover from clay to bronze: this seems to have been fairly straightforward, being accomplished in a small, primitive foundry in Ballina where his first half dozen casts were produced and which were exhibited in Belfast at the Tom Caldwell Gallery in December 1998 where he continued to show until the owner died. Scott is not one of those artists who are constantly changing stylistically. He prefers to plough the furrow ever deeper. That furrow (his initial template if you like) has, to change the metaphor, various contributory streams. The mythic aspect is one that has attracted many Irish sculptors, be it an Oisin Kelly, Conor Fallon or John Behan. Then there is the Salon animalier tradition, that of the wild beasts of Antoine-Louis Barye, Gaston Lachaise, François Pompon’s bears, the ‘high-end’ work of Claude Lalanne and his wife, culminating perhaps with Rembrandt Bugatti (his panthers in particular) whom, it might be suggested, had a powerful influence initially. Asked about him the artist responded, calling him ‘quite brilliant. His pieces were very faithful to the form’. Those tributaries have also been irrigated by two others. 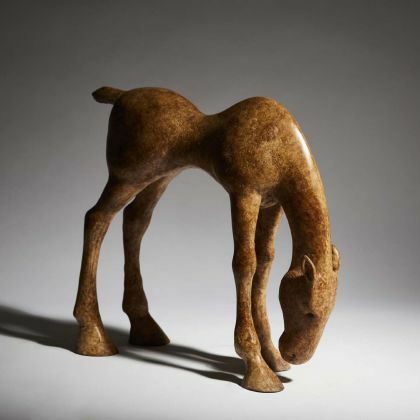 First of all, there is the Modernist tradition, a lineage which runs from Gaudier-Brzeska’s stags, the sinuous curves of an Archipenko, Arp or Brancusi, Elie Nadelman with her Wounded Bull, artists as various as Eric Gill, Epstein and Marino Marini’s horses, forward to Elisabeth Frink (horses again), Barry Flanagan, Lynn Chadwick and Michael Ayrton. This is then torqued by the world of art in pre-history. One might think of Cow and Small Horses, the Bull and Cattle, Wounded Bison, or Man and Rhinoceros in the Lascaux Caves; The Toreador Fresco at Knossos; the silhouetted style of Sumerian art such as the British Museum’s Standard of Ur; or the animals on Attic ‘black figure’ style amphorae, or even Hellenistic sculptural friezes. 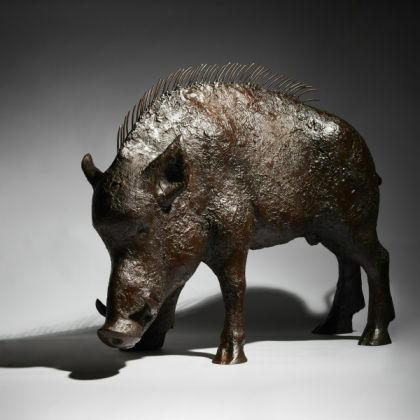 If one declension runs from the Mythic to the Modernist, the other runs from the 19th century animalier sculptors to the rural Irish farming tradition represented by the likes of John Behan. Fusing these different tributary streams is the artist’s manner of generating content. Like many others (Elizabeth Magill, Eithne Jordan and Eilis O’Connell would come to mind) Anthony Scott is an organised collector of images. Clippings from magazines or newspapers, photographs that he has taken over the years, and life drawings enabled ‘by access to my brother’s farm’ are meticulously kept in an archive ‘all labelled and filed’. For inspiration he flips open a file, noting that ‘something that had no relevance ten years ago can now suddenly have potency’. In relation to using the figure, he utilises himself as a model which is why you can discern the line of his jaw, or his eyebrows, in many of the works. This, he says, is a slow and frustrating process in which he uses two to three different mirrors and so therefore works from a number of different angles, at the same time having to deal with the reflections. 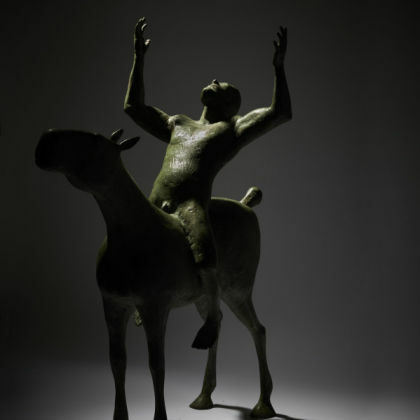 If the bull, the hog, and to a degree the horse (with or without its rider) are ongoing themes, each one generating the next one, then the introduction of the human form ‘which will probably become more integral in future sculpture’ is his way of extending the narrative arc, one in which the animal earths the human figure: ‘the human on the animal broadens the canvas considerably. It gives the work more depth’. When these elements fuse with myth (‘myths are the conduits’) narrative is transcended and we gearshift from the pedestrian to the poetic. Like most sculptors Scott is happiest talking about technical aspects: ‘you want the form to be as challenging as possible’. 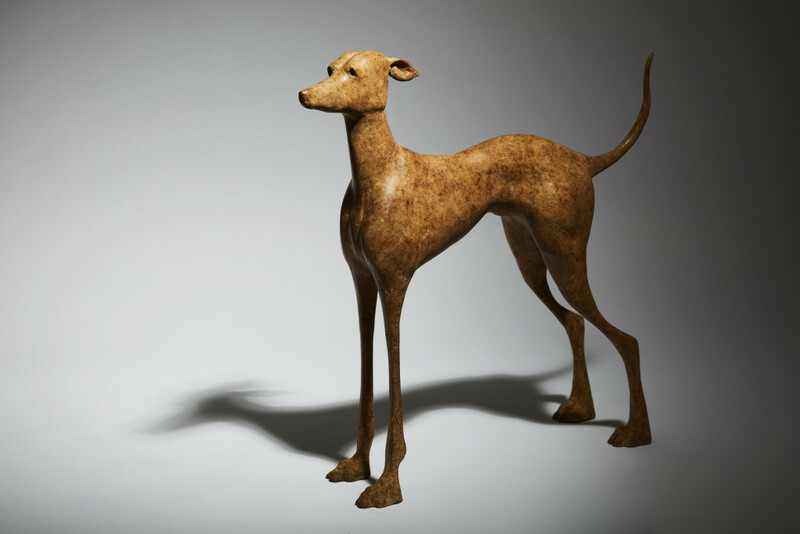 Referring to his various sculptures of dogs, his observation is that what he is looking for is ‘getting a line that satisfies’. 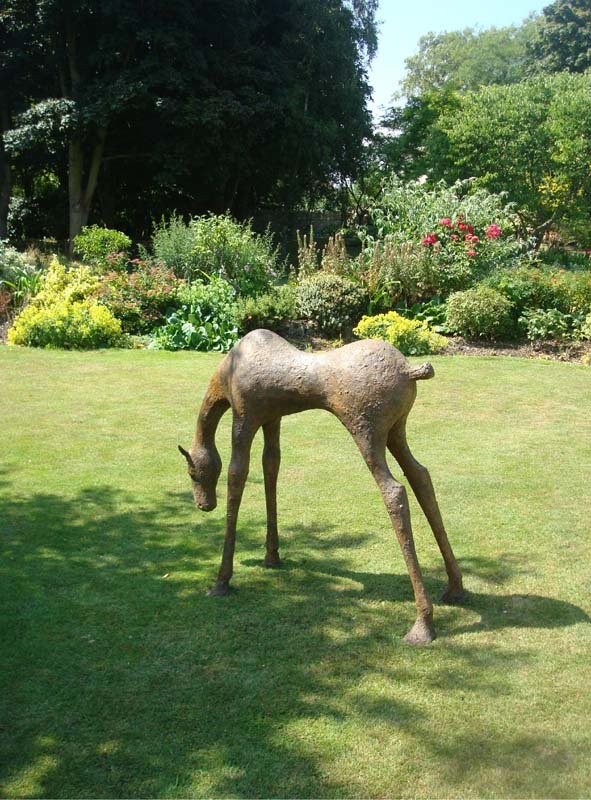 When you turn the sculpture in any direction it has to be ‘challenging and pleasing in equal measure’. 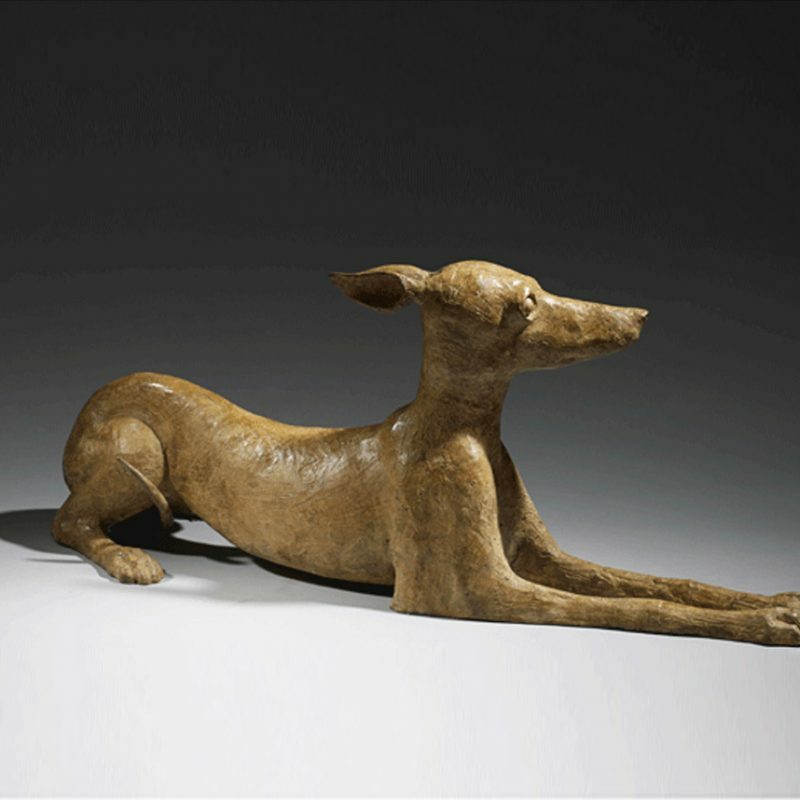 When one first looks at the sculptures they seem to have a strong sense of realism: muscle and sinew; flesh and bone; a movement, be it perked ears, the twist of a neck, or a stride interrupted. The hog (Cian) – and as a keeper of pigs one recognises the exact and pertinent demonstration of its alert stance – is the essence of feral intelligence, momentarily immobile as it processes the possibilities of an attack from without. Likewise, The Hunter (Red Mask), with his tilted-back head, is marking out his next move whereas Warrior (Blue Mask), a complementary variant, although caught on the cusp of turning, is not alarmed, as is demonstrated by the relaxation of his muscles. Yet all of these works are not actually veristic. Rather they comprise a series of deliberate distortions. With The Hunter (Red Mask) for example, instead of a classically exact Greek or Roman body, we have a figure with surprisingly small ears in relation to the size of the head. Likewise, the nose and eyes are closer to signs than to realistic depiction. The hands seem to be slightly too large for the body and there are distinct oddities in the overall articulation of the bones, joints and sinews. 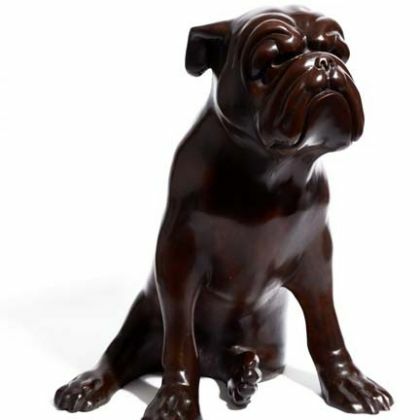 To a degree, the surface texturing (pitted, pocked, striated) combined with the patination, suggest a weathered statue that some archaeologist has recently excavated. Yet despite this archaeological aspect, the russet tones and the musculature still manage to suggest a living and breathing individual. 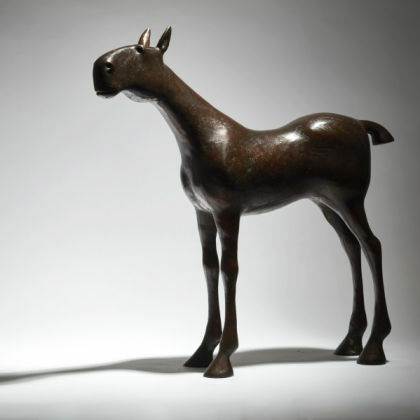 With the sculpture of the horse called Etain the jump-starting process originated in a reading of The Táin: ‘in the stories I’d always envisaged the horses as feminine…we had draught (masculine) horses on the farm, and I’d had experience of the birthing of a foal. In the story, with the first gulp of air when you are born, Etain becomes “a vapour of the mind”, and being fully emancipated, is able to stand up on her own’. 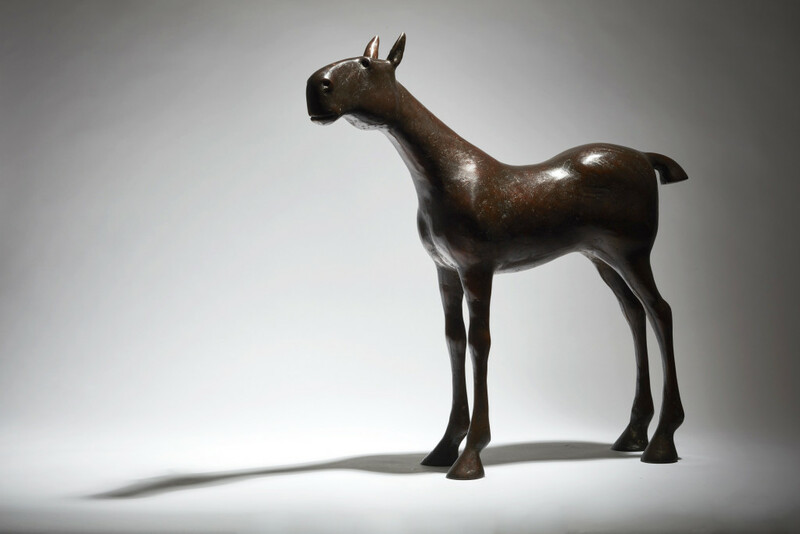 The ears are exaggerated (‘I like them but they shouldn’t make sense’) and, for the artist, the femininity resides in ‘the long elegant line of the horse’. 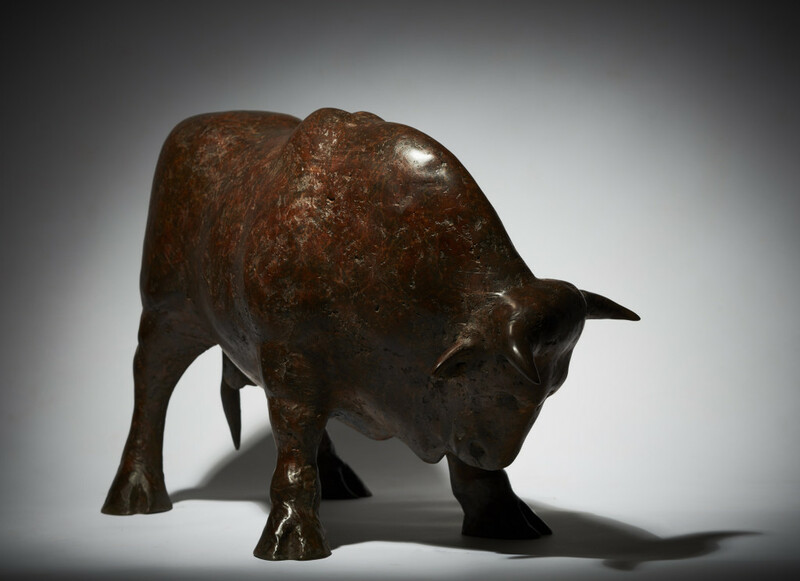 There is, he acknowledges, ‘a lot of Marini in the head’ but again, by a combination of the texturing and the patination – those deep, pitted fissures absorb copious quantities of the patination – a productive ambiguity is created. With the pitting and the scoring and the autumnal russets flecked with notes of green, the horse, created for an outdoor site, plays into the natural world whilst simultaneously being a translation of it. 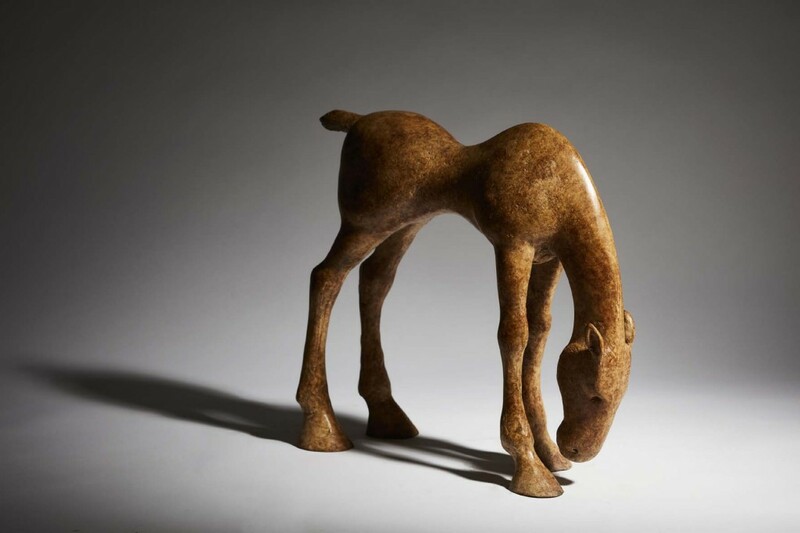 Looking at the denizens of his animal world, the Small Grazing Foal, chunky and heavy yet with the signature sinuous line, the Draught Horse 2017 (equally chunky), or the Maquette for Etain with its elongated neck, and legs which look longer than in real life, the spirits of pre-history, of the Lascaux caves, are irresistibly summoned up.